New Romantics Press is thrilled to welcome successful author and fellow RNA member Sue Moorcroft to our blog. Lizzie has known Sue for quite a few years now (!) but thought some of our followers would like to learn more about Sue and her books. I write women’s commercial fiction and my current contract is with Avon Books UK, part of HarperCollins. I also write short stories, columns, courses, serials and novellas, and I’m a creative writing tutor. I love being a full-time writer but in the past I worked for a bank, a digital prepress and Motor Cycle News. What, for you would be a typical writing day? I start about 7.30am and finish around 6.00pm, generally Monday to Friday but sometimes weekends. I usually take a couple of hours off for Zumba, FitStep, Yoga or piano. If I can, I shoehorn in a cuppa with my gym buddies. I always have a clear idea of my day: planning, writing a first draft, editing, writing front or back matter, working on promo with my publisher’s PR agency, writing course material etc. When I’m writing a first draft I tend to edit the day before’s session before moving on. It gets me in the zone. 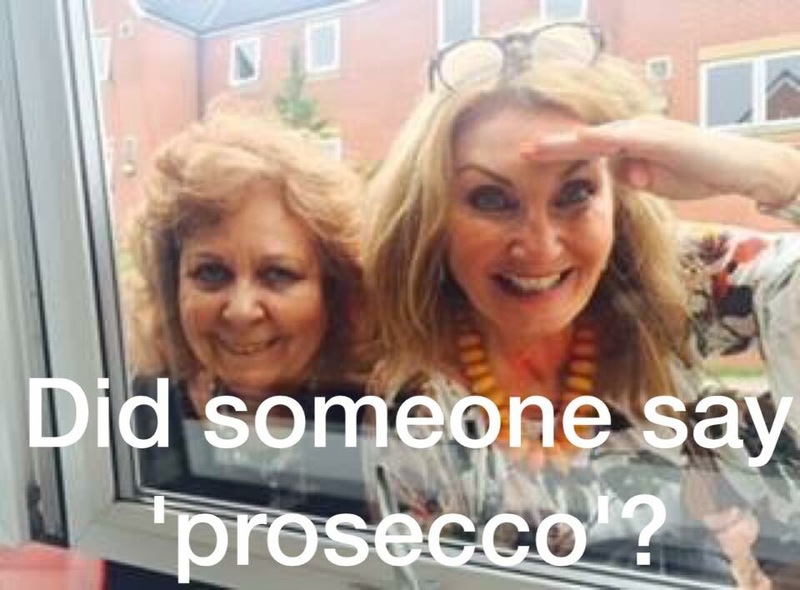 We all have to embrace it, so Social Networking – a help or a hindrance? do you have any advice for fledgling authors? Persist – I truly believe the name for an author who doesn’t give up is ‘published’. Expand your knowledge. Other creative careers demand years of training so why shouldn’t writing? Learn about publishing as well as writing so you can act professionally and in your own best interests. Don’t be afraid to try different writing techniques. You never know when you’re going to discover something that works for you. Balance a ‘can do’ attitude with healthy realism. You’re entering a competitive field that might involve sending work to someone you don’t know and hasn’t asked to see it, or presenting your writing to readers when there are a lot of other writers for them to read, so try hard to do the best job you can. We’d love you to share your top five writing tips with us, Sue! Learn about viewpoint (from whose perspective you’re writing) and what use of it is acceptable in your genre or desired by any editor or agent you’re approaching. Understand how to show rather than tell. If this seems hard, think about running everything through your viewpoint character: see, hear, taste, feel, think and know what they see, hear, taste, feel, think and know. Give your characters actions that reflect what they’re experiencing, ie Melissa wiped the sweat from her eyes rather than Melissa felt too hot. Ultimately, you’re writing for readers. Do you know who they are and what they like? If you’re self-published this can be all you need to know … but it’s important that you do because you don’t have a publishing house to take care of such pesky details. If you’re seeking traditional publishing you need to understand what the editor/agent wants, too, as that person is the gatekeeper to your readers. Hone your dialogue. Conversation breathes life into characters and passes information to readers. It’s a boon to your character development as vocabulary, syntax and rhythms of speech can indicate region, religion, education, interests, social adeptness, career, experience, mood and a host of facets. It can indicate the dynamics of a relationship, too – characters don’t usually speak to their mother in the same way they speak to their lover, for example. Plunge into your story. View the first page/first chapter as an access corridor and don’t clutter it with too much description or backstory. My next book is The Christmas Promise and though scheduled for September/October publication it’s available for preorder now! For Ava Bliss, it’s going to be a Christmas to remember … On a snowy December evening Sam Jermyn steps into the life of bespoke hat maker Ava Blissham. Sparks fly, and not necessarily the good ones…When PR guru Sam commissions Ava to make a hat for someone special to him she makes a promise that will change her life. She just doesn’t know it yet. Ava needs this job – she’s struggling to make ends meet, her ex-boyfriend is a bully and she’s desperate for distraction because no one dreads Christmas like Ava Blissham. Soon Ava finds herself reluctantly needing something from Sam. He’s quick to help, but Ava is in for a nasty shock… Can Ava keep a cool head and be true to herself? Will she be able to keep her promise? If she does, might this be the Christmas dreams come true? Having just finished the copy edits for The Christmas Promise I’m catching up on blog posts and writing a short story for S Magazine. Then, bliss, I’ll be able to return to Just for the Holidays, which is due to be published in May/June 2017. It’s about Leah, who has actively avoided acquiring a husband and kids, being stuck in France … looking after her sister’s husband and kids. On the bright side, she begins a holiday romance with Ronan, a grounded helicopter pilot spending the summer in his holiday-home next door – until his ex-wife turns up to live with him. Thank you so much for sharing your time and expertise with us Sue. Good luck with all your projects. If anyone would like to learn more about Sue, here are the links where you can find her. Firstly, thanks so much to the New Romantics Press for featuring my new book here – it is an honour indeed! It’s a pleasure to support a fellow author, Terry, and we have learned so much about the publishing world through following yours and Rosie Amber’s blogs (to name but two). So, fire away and tell us all about your new novel – The House of York. 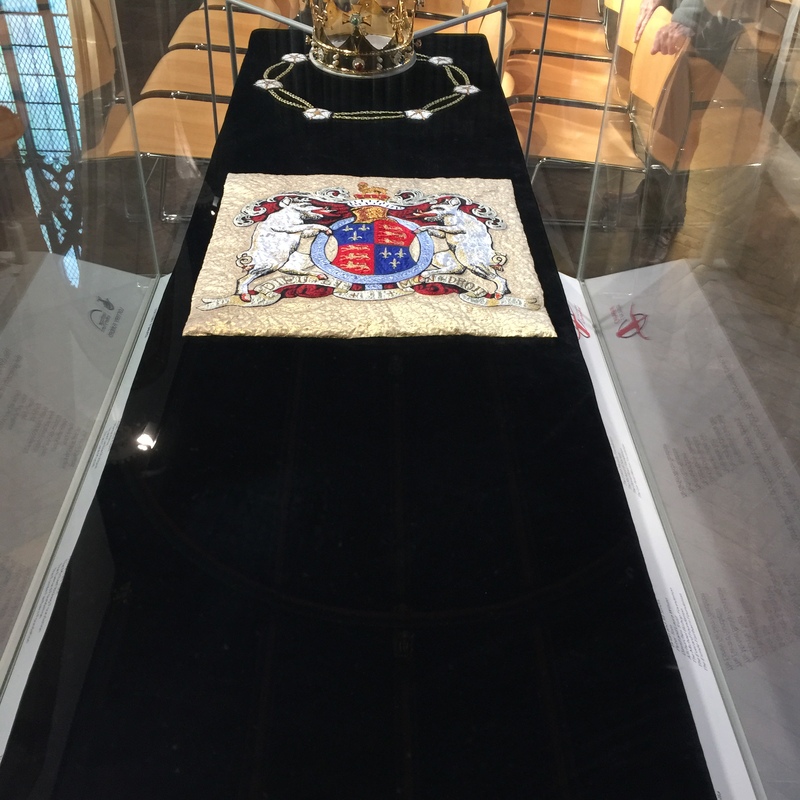 The story was inspired by the events of the Wars of the Roses, though it’s not an actual retelling of history, like Kings and Queens and Last Child (about the Lanchester family, modern day Tudors). I hasten to add that you don’t need any knowledge of history to enjoy this book, though anyone who knows a bit about the Plantagenet era will recognise the York brothers, and others. I hadn’t intended to write a sequel, but my test readers all say that the massive twist at the end made them want to carry on reading, so I shall be starting that very soon; it’s already begun in my head, usually when I’m doing things like cooking (cue overcooked vegetables). I’m thrilled that the book has already gained some very positive reviews, and even more delighted that several people started reading it the minute it was published – the biggest compliment a writer can have. THANK YOU! New Romantics Press is really looking forward to reading and reviewing THE HOUSE OF YORK, Terry. 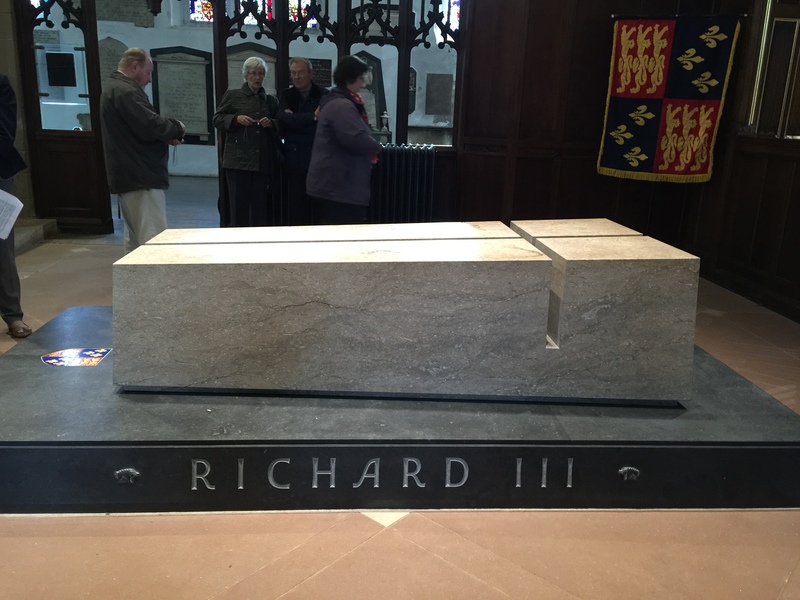 You may not know this, but we live in Leicester and recently, Lizzie visited the Richard III exhibition. Here are a few photos to get you writing that sequel. A turbulent time in history, indeed. Good luck with this and all future projects. 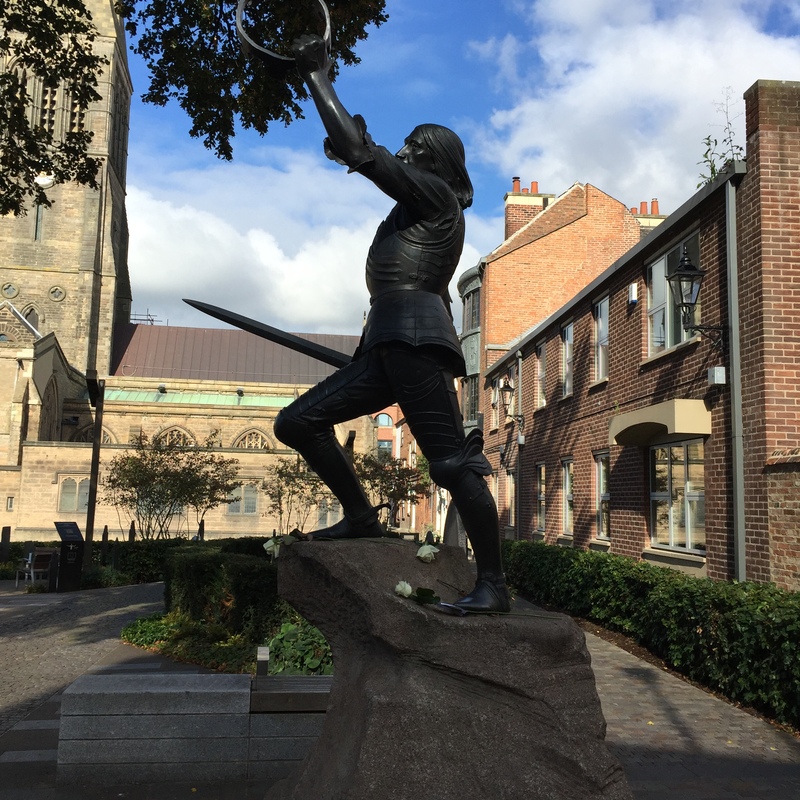 KRIII statue outside Leicester Cathedral – recently moved from Castle Park. A reconstruction of Richard Third. They now believe that he had ‘dark blond’ hair and are about to change the wig to reflect this!